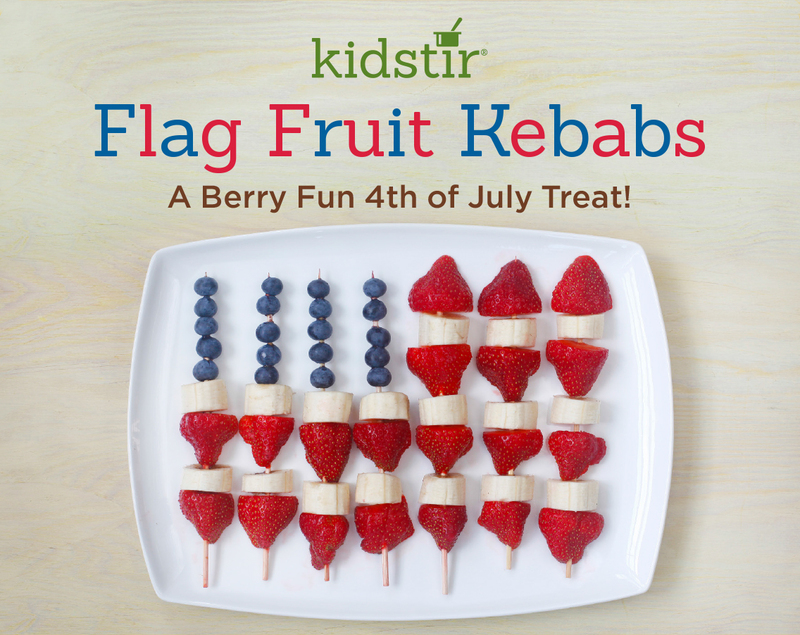 Looking for a quick & healthy 4th of July snack? Make these berry good kebabs! Start with fresh, seasonal berries. Serve them for breakfast on America’s birthday or as a post-parade treat. Happy 4th! Wash about 20 strawberries and 20 blueberries. Slice the tops off the strawberries. Peel and cut 2 bananas into 1-inch pieces. Gather 7 wooden skewers. Thread 5 blueberries on 4 of the skewers for the blue section of the flag. Then add a banana piece, followed by a strawberry below the blueberries. Repeat with an extra strawberry and banana slice and set on a platter. On the 3 remaining skewers, thread strawberries and bananas only. Place them on the platter—the bananas and strawberries should line up to look like the stripes on a flag. Drizzle with a little lemon juice to prevent browning. Enjoy!